The arts world lost one of its longest-serving Congressional champions with the passing of Congresswoman Louise Slaughter (D-NY) on March 16. As a Co-Chair of the Congressional Arts Caucus, Rep. Slaughter often championed the cultural agencies in floor speeches and at Arts Advocacy Day. Mary Anne Carter who was appointed by the Trump Administration to serve as the NEA’s Senior Deputy Chairman will serve as Acting Chair. In March, the Senate confirmed Ms. Marie Royce as Assistant Secretary for Educational and Cultural Affairs. Ms. Royce previously served on the Advisory Committee on International Communications and Information Policy at State, on the Board of Trustees at the Meridian International Center, and was a former educator and university professor. The House released its proposed funding bill for the Interior, Environment, and Related Agencies. The bill proposes providing $155 million in funding for both the National Endowment for the Arts and the National Endowment for the Humanities for fiscal year 2019. This is the amount that arts advocates have requested for the past several years. This is just the beginning of the appropriations process. The Performing Arts Alliance will continue to send updates when action is needed. Arts education grant opportunity NOW open at U.S. Dept. of Education. Following a $2 million increase in funding approved by Congress for FY18, the U.S. Department of Education has announced a new grant opportunity under the Assistance for Arts Education Development & Dissemination (AAEDD) program. The four-year grants invest in arts-based educational programming in schools that increases access to standards-based arts education, integrates arts education into other subjects as part of a well-rounded education, and improves students’ academic performance, including their knowledge and skills in creating, performing, and responding to the arts. These grants are awarded for school-based partnerships in which 20% or more of the students served are from families with an income below the Federal poverty line. The deadline for the notice of intent to apply is May 16, 2018, with a deadline of July 2, 2018 for transmitting the application. For more information, please visit the AAEDD applicant information webpage. In the meantime, T-Mobile’s planned deployment in the 600 MHz band is being rolled out. T-Mobile has posted a letter and county list outlining its plans and the impact on wireless microphones, here: https://howmobileworks.com/spectrum/. The entire list should be reviewed periodically, as it is updated regularly. The webpage allows people to register to receive future email notifications as this list is updated. The FCC completed its auction of the 600MHz frequency band (616-653 MHz and 663-698 MHz.). Sound systems should be checked for compliance. Most manufacturers are offering rebates on new systems, but the window for rebates is closing soon. The comprehensive tax reform provisions signed into law last December included changes that will require nonprofits to pay a new Unrelated Business Income Tax (UBIT) on the value of commuting and parking benefits provided to employees at the corporate rate of 21 percent, beginning on January 1, 2018. Since many performing arts organizations offer parking and transportation benefits, the costs of these new UBIT requirements could be considerable. PAA Member organizations have joined with our colleagues to express our concerns with this policy and request Congress delay implementation and seek to narrow the application of the new rules. PAA member League of American Orchestras was featured in a national podcast by Independent Sector, providing an overview on this complicated area of tax policy. 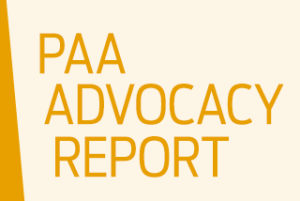 PAA continues to advocate for tax policies that positively impact artists and arts organizations. For updates on all these topics and more, along with easy ways to help advocate for change, please visit PAA at https://www.theperformingartsalliance.org/issues/ or see our Advocacy Tool Kit page here: https://www.theperformingartsalliance.org/tool-kit/advocacy-basics.